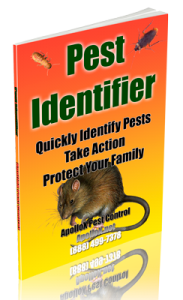 Protect your family from being stung by pests like the baldfaced hornet. 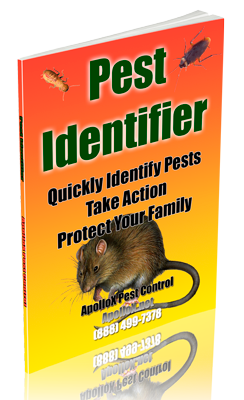 ApolloX Pest Control will remove the baldfaced hornets from your home quickly, efficiently, and safely. 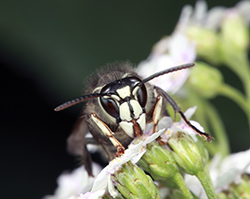 The baldfaced hornet gets its name from the ivory-white markings on the face. The thorax, legs and abdomen also have white markings. The baldfaced hornets are best known for their large football-shaped paper nest, which they build in the spring. The nests can reach 3 feet tall. Nests are usually located in bushes and shrubbery – at least 3 feet off the ground – and in trees as high as 60 feet or more, and are sometimes found under the eaves of buildings and other manmade, protected locations. In the spring, fertilized queens that have overwintered in protected places such as in hollow trees, rock piles, under bark and in the walls and attics of buildings, become active and begin to build a nest. As the summer progresses, the colony grows until there may be 100 to 400 workers. Hornets are protective of their nests and will sting if disturbed. 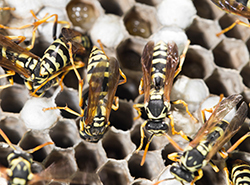 Individuals with known sensitivities to wasp and bee stings should have any nests close to their homes removed by professional pest management personnel (pest control companies). Wasp venom wages a staged attack against the nervous system on a cellular level. The stinger delivers the venom to the victim’s blood stream. Peptides and enzymes in the venom break down cell membranes, spilling cellular contents into the blood stream. When the cells in question are neurons, which serve the central nervous system, this breach causes the injured cell to send signals back to the brain. We experience these signals in the form of pain. To make sure the pain keeps coming, other substances in the venom, such as norepinephrine, stop the flow of blood. This is why the pain of a wasp sting can last for several minutes, until the blood stream can carry the diluted venom away. Finally, hyaluronidase and MCDP (mast cell degranulating peptide) pave the way for the membrane-destroying elements in the venom to move onto other cells by melting through the connective tissue between them. 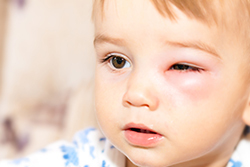 This spreading factor leads to the swelling and redness associated with most insect stings.